I love scented laundry products. The problem is that after a day your clothes lose that great out of the dryer scent. 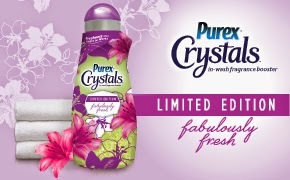 I received Purex Crystals in the Limited Edition Fabulously Fresh scent to test out. The crystals are a laundry enhancer which eliminates odor and freshens laundry. All you do is add the crystals to the washer with your clothes. It is a natural softener that is safe to use on all loads and high efficiency washers. Most importantly, it keeps your clothes smelling fresh for weeks. The scent smells like a flowery Spring day. Not an overpowering scent at all. My clothes were still smelling great a few weeks later. Want to try this product? 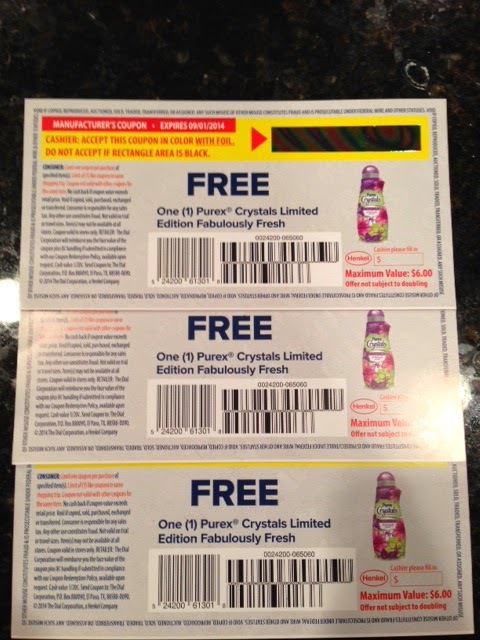 Three lucky winners will be chosen for a free coupon of Purex Crystals in Limited Edition Fabulously Fresh. Thanks for the chance! Sounds like they smell real good!